You are at:Home»Healthy Eating»Why Portion Control Containers Are Effective ? Why Portion Control Containers Are Effective ? Want a stomach so flat that you could iron clothes on it? Well it is im-“portion” that you exercise portion control. We all know that nutrition plays an essential role in helping you achieve your weight-loss goals—that means eating healthy and maintaining proper portion sizes. However, many guys and gals are playing Russian Roulette with calories, yet wonder why they’re not losing weight. Does that sound like you? If so, it is time you take the guess work out of how much you’re eating and start using portion control containers. These type of containers are designed to help you stop guessing, weighing and counting calories. Let’s be real: Who has the time and patience to count and weigh every single calorie every single day??? I am sure you don’t. Portion control containers make your quest towards a “iron board” stomach much more easier. With so many portion control containers on the market, which one should you choose? Here are two that I highly recommend that you add to your weight loss repertoire. Are you looking for 21 Day Fix Containers ? My recommendations here. When it comes to choosing portion control containers, it is vital to look for ones that are simple to use, carry & store. 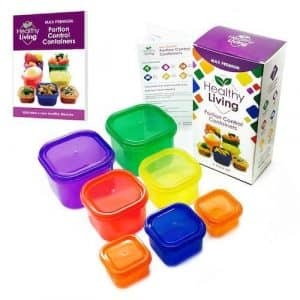 The Healthy Living 7 Piece Portion Control Containers Kit fits the bill. 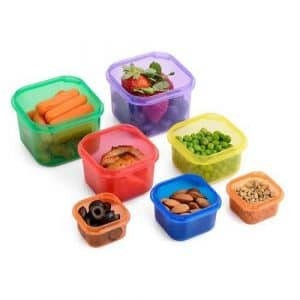 This product utilizes seven color-coded, portion-sized containers to help you organize your food items. For instance, the purple container is designed to hold fruit while the red one is tailor-made for protein foods (e.g., eggs, steak, chicken, etc.). Another great aspect of this product is it comes with a complete portion control guide. The guide will show how many portions you can have from each category and plan out your meals and snacks accordingly. With a 4.8 out of 5.0 rating on Amazon and high praise from the majority of customers, these portion control containers are a worthy investment. Whether you are an aspiring fitness model or the average Joe/Jane looking to cut some body fat, this kit will greatly aid your meal preparation needs. Available on Amazon.com. If you’re looking for another portion control containers option, then opt for the Meal Prep Haven 7 Piece Multi-Colored Portion. Like the Healthy Living containers, these come with systematized seven color-coded, portion-sized containers that helps you separate particular food ítems. This containers are designed to help you know what (and how much) exactly that you are putting into your body. What is really remarkable about this product is that each container set comes with a detailed guide explaining how to measure your daily intake. With a 4.5 out of 5 rating on Amazon and mostly glowing reviews, the Meal Prep Haven 7 Piece Multi-Colored Portion is worthy of being in your kitchen cabinet. On stock at Amazon.com. Overall, both portion control containers is worthy of your hard-earned money. I hope this article helps you make an im-“portion” decisión in your pursuit of a leaner, healthier physique. Next Article Where to Get the 21 Day Fix Containers ?